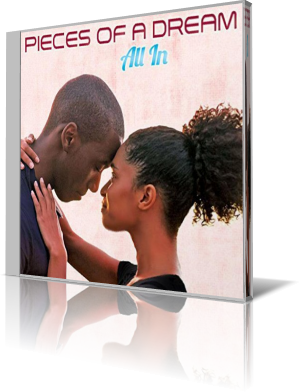 All In is Pieces Of A Dream's sophomore album on Shanachie Entertainment. The group consists of keyboardist James Lloyd and drummer Curtis Harmon. Their overall 21st album features their longtime live crew, guitarist Rhon Lawrence and bassist David Dyson. The recording is joined in addition by keyboardists Chris “Big Dog” Davis, Herman Jackson, Robert Pickard, guitarist Rob Bacon, drummer Teddy Cambell, saxophonists Tony Watson Jr., James Cunningham and bassist Byron Miller. The album has an overall uplifting start with Turn It Up. And that's to be taken literally. James Lloyd expands his talent on the keys enjoying with a sparkle of tones. Synth bass introduces into All In featuring rising sax talent Tony Watson Jr. in his best role. It's a special moment of the day, when lights turn on. Quiet Night In The City describes this instant and the melody just pearls out of James' piano. Watch Your Step lays the melody on a stomping beat and gives the song the right turn. Giving a production into Chris “Big Dog” Davis' hands is always a good decision. He and saxophonist James Cunningham make a catchy One For The Money. Guitarist Rohn Lawrence provides the additional fine-tuning. Caribbean Nights offers not only atmospheric music but also a terrific duet between Rohn Lawrence and David Dyson. When keyboardist James Lloyd creates a tune as individual musician there is no restriction. Human Interface draws from the full of his brilliant creativity. Up Till Dawn awaits you with new treasures at every turn. Two sax performers and Rhon Lawrence with an excellent guitar solo. The aptly titled Dream On verges on breathy and ethereal. How Bout That!!! by Chris “Big Dog” Davis shows anew guitarist Rohn Lawrence in a prominent role. Funky and to the point. With their unerring instinct for the perfect melody Pieces Of A Dream have created again a package that will delight radio hosts and listeners in equal measure.